In June of 2010, we began an education technology development project called Helping At-risk students Learn Fractions (HALF). The goal of the HALF project is to develop instructional tools for classrooms that help struggling students reach competent levels of performance in fractions. Toward that end, we developed two products: a technology-enhanced fractions intervention and a diagnostic assessment. We designed both products to be compatible with mobile technology such as the iPad. The HALF intervention is a fractions intervention designed for use in fifth- and sixth-grade classrooms. 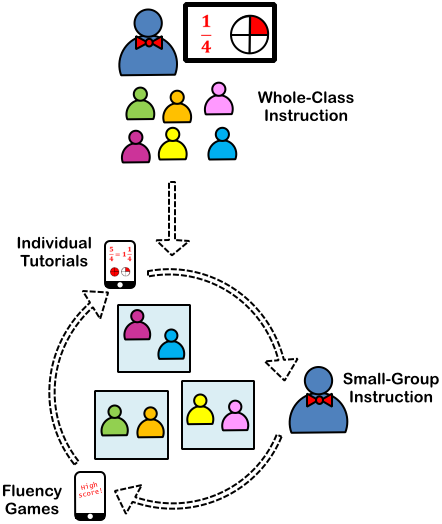 HALF uses a mixed-methods instructional model that blends technology-based instruction delivered using tablets with teacher-led instruction. The curriculum is designed to aid teachers in differentiating instruction for both low- and high-achieving students through rapid feedback on student performance and embedded instructional recommendations. It also ensures that all students receive rigorous instruction about fractions that aligns with the Grade 5 and Grade 6 Common Core Standards for Mathematics while simultaneously helping students to catch up on any basic fractions concepts they have not yet fully mastered. At the beginning of the HALF project, we began developing a diagnostic fractions assessment. We tested the assessment in a wide range of classrooms. During the testing process, we learned that many teachers who were not planning to implement the HALF intervention in their classes valued the data they received from the assessment. We also learned that many other researchers who are not part of the HALF project are in need of a reliable measure of students' understanding of fractions. For these reasons, we began expanding the assessment branch of our research. What started as a simple attempt to develop an assessment for our own fractions intervention eventually evolved into a comprehensive project in its own right. The research reported here was supported by the Institute of Education Sciences, U.S. Department of Education, through Grant R305A100110 to Vanderbilt University. The opinions expressed are those of the authors and do not represent views of the Institute or the U.S. Department of Education.